I almost whimped out. Almost. In fact, I even drove to my usual spot, due to the weather, and had turned back when I stepped out into stinging hail. Instead of continuing home, I looped around and went back. 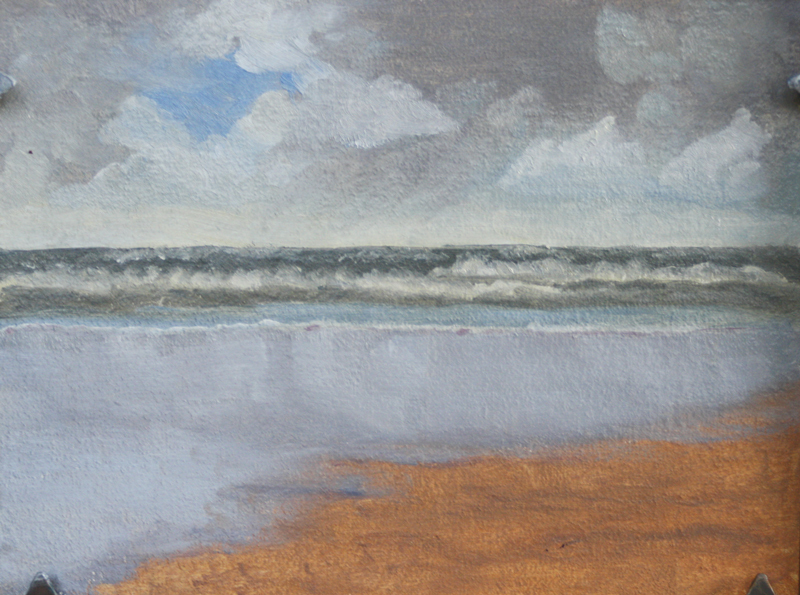 This time I got out, shrugged on my painting pack and hiked up the beach. 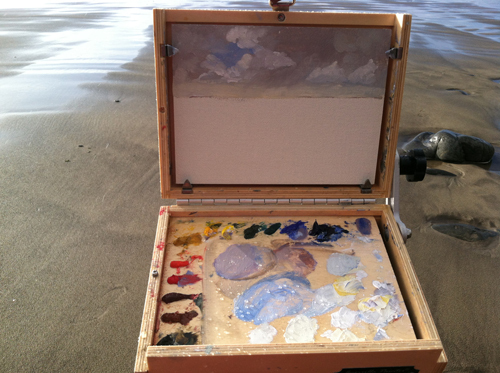 I painted the above painting plein air, directly onto the panel. A first for me. Time is short today so I knew I had to make that transition. 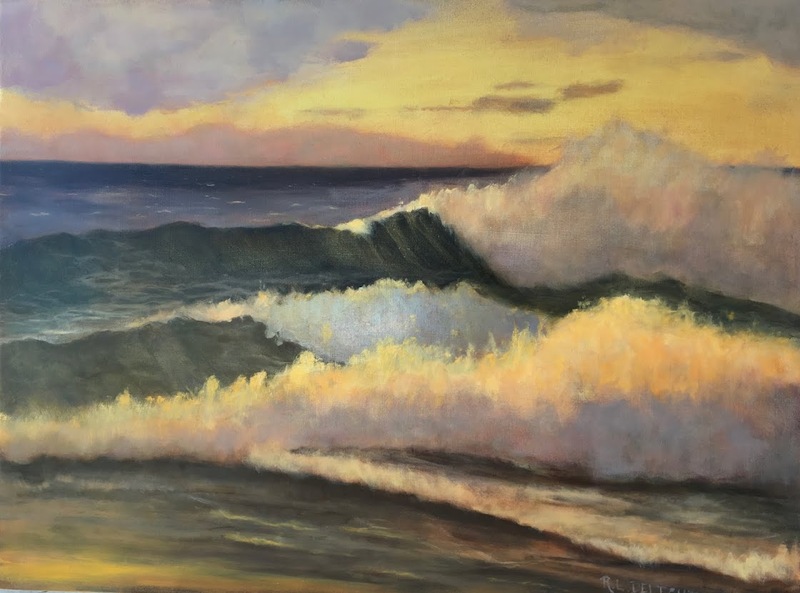 I will still be doing wave studies on loose canvas but I will also paint directly. No time for measured consideration here. 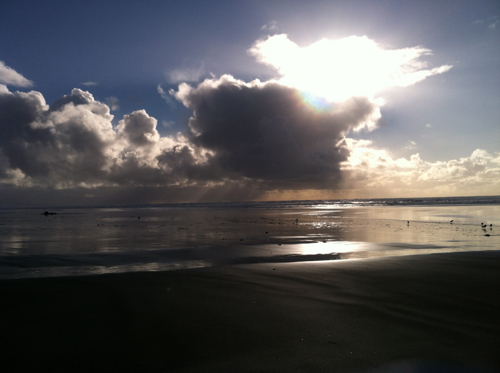 I was hit with three waves of hail, battered by wind, and shivering from cold in spite of several layers of clothing. I painted fast, about 2 hours including set up and take down. I also would like to mention it was a minus tide this afternoon and the tide was way out there. I took this picture while the painting was still in the holder so the box is shadowing the painting on the right side and the holder. I still have to sign the painting and smooth a couple of paint ridges and then I will take a proper picture. I have been doing work on my website and planning for some changes to my blog in my spare minutes between. They will be appearing soon. I am off to post this on Leslie Saeta's blog for the challenge before making dinner. I keep nodding off mid-typing. Perhaps a quick nap in between? Tomorrow afternoon is an errand day so painting in the morning. I will leave you with a picture of my office this afternoon and of my palette and painting in progress. Look closely at the palette, there is hail in with the paint! My office was being a tad bit over dramatic this afternoon! Extreme Plein Air, hail on my palette! Good for you that you didn't "whimp out", and stayed to capture this plein air -- lovely painting! Hi R.L., I love your painting, great sky. Enjoyed visiting your blog. I think I'm in love with this one. It looks great and the sky just right as is the overall balance of it. It's interesting and soothing all at once. Hope you got your nap in and can't wait to see your blog changes! I am so impressed with your waves as I scroll back through your recent posts. I'm also in awe, as always, of your disciplined approach to your work. Wimp out indeed. I don't think it is wimpy to decline to paint in hail storms, but you are tougher than me. Go Renee! @Dana I am so behind in my blog reading but will catch up after this challenge. Looking forward to being inspired by your lovely textiles and table settings.